What is the Best Scale of Action Figures to Collect? 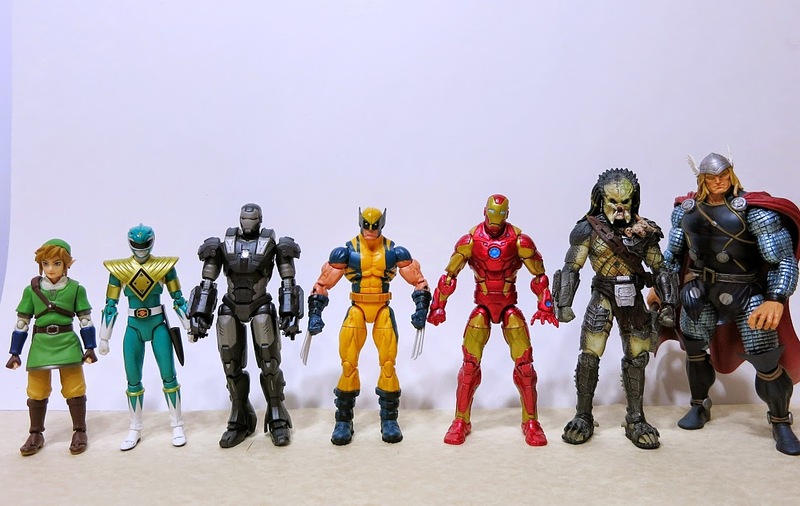 What Scale Action Figure Should You Collect? It’s a trick question of course there is no best size of figure. What this guide will help you with, however is to highlight the pros and cons of the various scales. So if you’re just starting out or you already have an extensive collection in one scale and have been wondering about delving into the others then this is definitely the guide for you. Now we’re going to avoid the secondary market here and focus on an accurate shelf price reading for current figures, simply because if the secondary market becomes a factor then there’s all kinds of other variables that enter into play, such as age and scarcity of the figures, postage costs and ultimately scale itself ceases to be the deciding factor. Though I will mention reselling as we go along when it’s applicable. So to get an accurate reading I’m going to compare prices among figures in the same shop, which will be Toys R Us in North America and the UK. And it’s an absolute given that you can find these same figures more cheaply if you shop around, but we’re going with retail price for the purposes of standardization. There are some very small figures out there including a line of 2” Guardians of the Galaxy. Though these are still poseable, they appear unimpressive in stature and you don’t get much for your £5.99. They even require massive rocket launchers to pad out the two pack. This is a relatively new development, though other lines have attempted this in the past. I’d suggest holding back for now and seeing if this scale develops. Feasibly there is plenty of scope for massive lines of cheap little figures. However if you want personality in this scale Lego cannot be beaten. Blind bag Lego figures are huge business right now and all of them fit with your existing Lego kits, dating back to the 70s. We’ve done a couple of fantastic, in-depth videos on these, so check those out for more details on the king of the micro figure. There are also 2” tall minimates and Kubrick to consider as an adult collector, especially because they will embrace licenses Lego won’t, such as Battlestar Galactica. Minimates are replete with poseability and specialised heads, clothes and accessories that Lego lacks. Brits unfortunately will have to look for these on import as they are unavailable on shelves. At roughly $19.99 for presentation four packs or if you shop around $5.99 for two packs this scale is by far the most reasonable way to amass a huge collection of tiny figures. They also sell excellently online, cost virtually nothing to post and in the case of Lego actively increase in value over time. In terms of cons to Lego and Minimates there really aren’t many that other scales don’t equally share. Possibly if you’re after realism over stylised renditions of figures then this is not the line for you. That would be where solid, fixed-base, collectable figurines come in. Now these would be your 3.75” tall figures, first majorly popularised by the Kenner Star Wars line at Christmas 1977. What started out as your basic shoulder and hip joints with swivelling head were evolved with the G.I. Joe: Real American Hero line in the 80s and have now become smaller versions of the traditionally more poseable 6” figures with some amazing detail and complexity. You also get 4” scale figures like the current Nickelodeon Teenage Mutant Ninja Turtles Line, again following on from the late 80s originals. Pros: Price is not too expensive. At roughly $8.99 in the USA and £9.99 in the UK for figures in this scale it’s possible to amass a collection of these without breaking the bank. There’s also variety. At this scale it’s possible and indeed encouraged by the manufacturers to present you the consumer with a ton of different options, all of which complement each other. Similarly if you are going to sell them on the postage costs to your buyer won’t be so hefty. Cons: Smaller figures being made of smaller parts may break more easily. Often they are designed with small children in mind and play over display so you might find less detail than their larger counterparts, especially as it’s just plain less easy to shrink down the master prototypes that small and still retain all that detail. Another con, specifically for brits is that Americans are paying £5.60 for figures we’re buying at a tenner. Americans that means your nine bucks would have to be sixteen if you were born on the side of the Atlantic that favours tea and cricket. 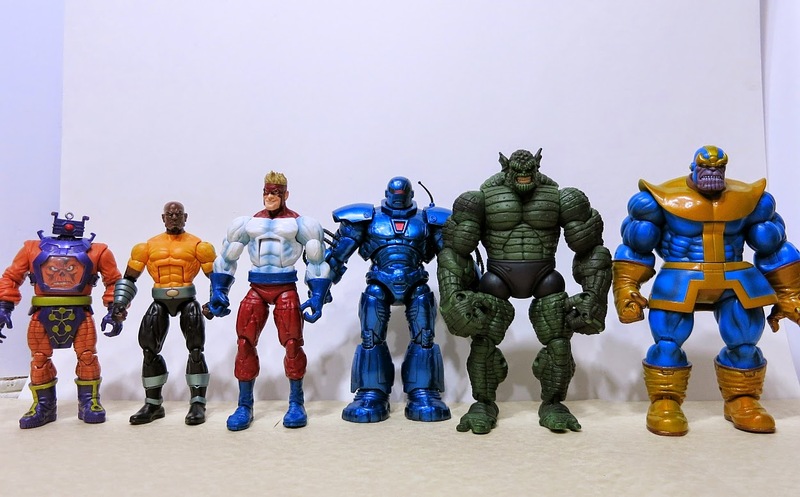 These are your 6” figures, popularly referred to as the Marvel Legends scale since this Toy Biz and later Hasbro line was home to virtually every well-known Marvel comics personality, in wave after wave of figures from 2002 onwards, and was itself extremely influential on DC, Masters of the Universe and eventually Star Wars. With this scale you can expect more detail, more sturdy articulation, heavier centres of gravity to help them stand, often but not always heavier and higher quality plastic. Occasionally as a negative result due to this articulation you will get a figure that’s like a handful of spaghetti and won’t hold a pose as their legs buckle out from under them. Another pro tends to be more lavish presentation boxes, while smaller figures tend to get simple blister cards. Double-pro if the figure comes in a box and can be both displayed loose and then replaced in the packaging entirely undamaged. This also helps resale on the secondary market. In terms of price current Marvel Legends will set you back $21.99 in the USA and £16.99 in the UK. Notably the difference in price between 4” retailing at nine dollars and ten pounds respectively and these 6” examples is more pronounced in America with a markup of 145% relative to only 70% in the UK. From this we could possibly conclude that 4” figures are overpriced in the UK and 6” figures are overpriced in the USA. So in summation for medium, this scale will cost you considerably more than small or micro. 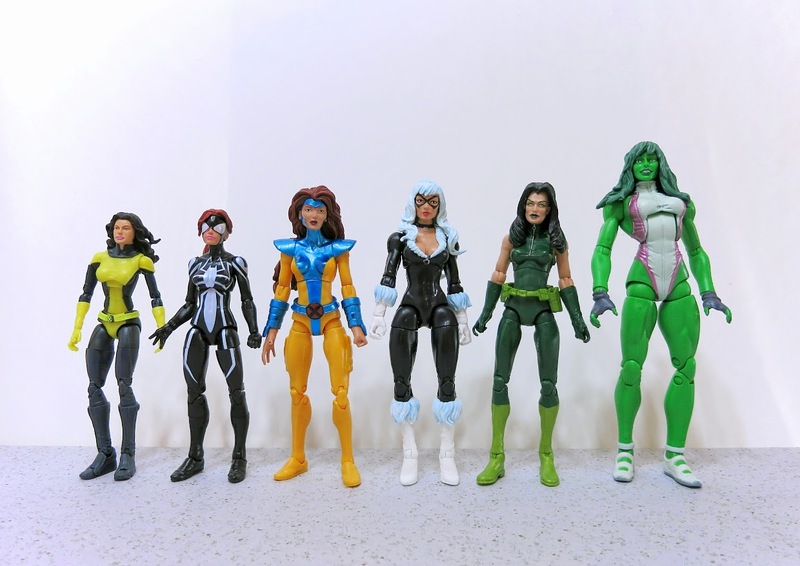 If the construction and detail appeal, or perhaps if it has considerable nostalgic value or if you just plain want a figure with a little more bulk and body to it then 6” is the way to go. At the other end, some are highly detailed action figures blown up to imposing size like this $99, 18” Joker from NECA. These are by and large for serious adult collectors or kids with wealthy relatives. Positives include these being genuinely impressive and a shelf, coffee-table or desk-related talking point with visitors. If you are seriously into both movies and toys, then these can include some of the highest quality, most desirable, finely crafted, rare and beautiful fusions of the two. Now here I’m talking about Hot Toys and their peer group. In terms of cons, high-end adult collectables in the 1/6th scale are the most expensive toys you can buy at retail, for obvious reasons. They can run at $250 for a figure and a collection may require an all-purpose loan. For these reasons Toys R Us of course do not stock them and you will have to look online and in collector-focused shops for these. So there you have it. At the micro end you have the cheapest figures, with tremendous range for collectability, with the emphasis being on style and play value. At the top you have huge 1/6th scale masterpieces with meticulously constructed clothing and armour and Madame Tussauds-levels of uncanny realism to be collected sparingly and discerningly. In the middle you have a range of scales that either constitute larger versions of the micro playthings or smaller versions of the top brass museum pieces, some of which sit exactly on the line in between. The important thing to note is that with the right attitude and the right level of knowledge of your chosen line anybody with a few bucks can become a figure enthusiast, and it’s that inclusivity and catering to all tastes and budgets that keeps our hobby going through recession and technological evolution. There will always be new children and there will always be the need for new toys. This scale relates back to the original G.I. Joe and Mego figures; something that could be called a “doll” by somebody wanting to be disparaging of our grown up collecting. Interestingly below this scale and it’s a toy. Neither of these terms summons up positive images of mature and manly men in the minds of the general public. But of course we’re beyond that stigma now and should apologise to nobody. So these dolls began life as the male equivalent of Barbie and quickly became our avatars of exploration and combat. Now there is a huge range of these available. You’ll find there’s fewer standard scales. They fall into two categories here. 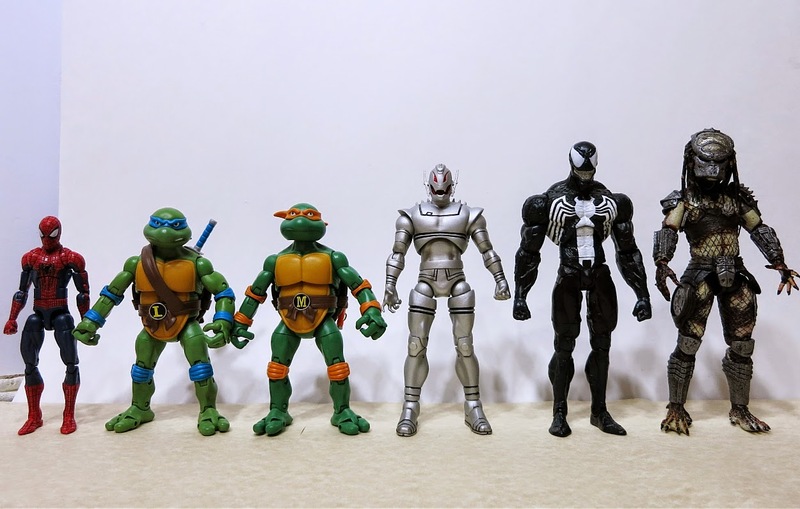 Oversized figures designed for kids and adult collectibles. The former are often very reasonably priced relative to their smaller cousins. The latter can be astronomical. To build upon the Marvel Legends 6” figure standard this Marvel Select Red Hulk is technically in the 7” scale but actually stands over the other figures at ten inches. And he’s only six dollars more than your average Marvel Legends fig at retail. In the UK these larger figures are more sparsely available, most likely due to cost of shipping something so large and heavy over here and the hefty import taxes which account for our higher shelf prices in general. UK viewers bear in mind Americans pay tax on top of the price of their figure and that varies from state to state. 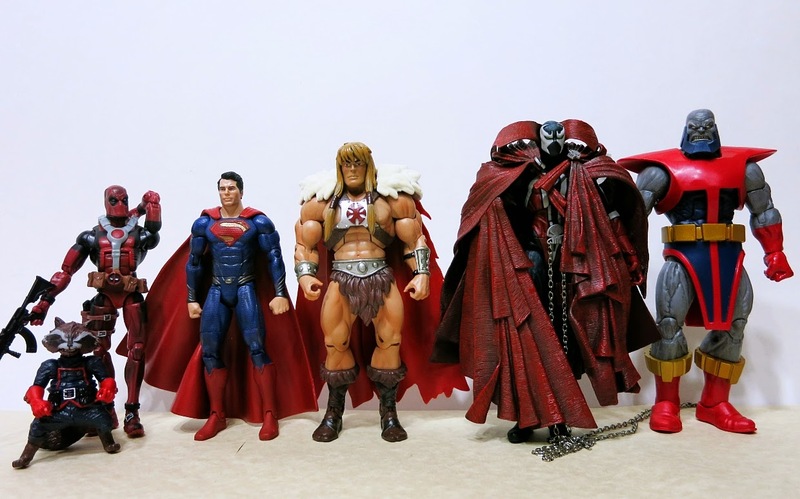 Cons for the toys include lack of standard scale and wide range within lines leaving your collection tall and eye-catching but very much an eclectic mix of what’s available. There’s also the issue of space as each of these takes up the room of several medium figures, more still in the small scale and potentially more than a dozen micro scale. A large collection of large figures could eat up valuable real estate in your house, whether in storage or on display. They will also cost a lot more to post out and tend to depreciate in value due to being mostly kid-focused.